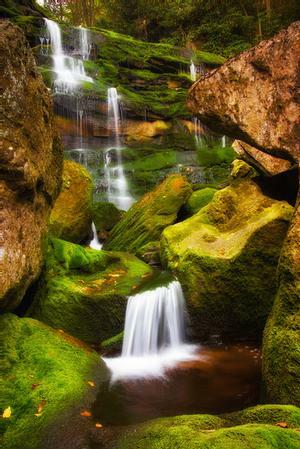 Blackwater Falls State Park, Davis, West Virginia. I'd have about two feet of room to stand, none of it flat and all of it slippery. The drop below would have meant at minimum serious injury...or worse. If I got there, the rock was so slippery and full of moss that the moss would just peel away under my feet. But yet, there's the shot. I got almost exactly what I wanted and didn't have to risk life and limb. All I had to risk was looking a little silly. How? After giving up and realizing it was too dangerous to climb down, I looked across to the other side of the gorge and thought maybe I could come at it from the bottom. The sun hadn't yet come up over the trees to spoil the good light, but it would soon. It was a race against time. I spent about 15 minutes navigating back up and across to the other side, went down below this spot and came at it from the bottom. I ducked under the ledge of a rock that is off the frame to the bottom left and came face to face with the bottom of the moss covered rock (the one at the bottom of the frame). There was no way I could climb up on that mossy spot. Whether coming at it from top or the bottom, the same 3 reasons I'd probably slip and fall still applied. I was about to climb away and give up when it hit me. Yes, I wouldn't have been surprised to look up and see an actual light-bulb above my head. I secured my left foot between two logs, stretched my right foot across and straddled the water below me to get purchase beneath the mossy rock. My arms were just long enough that I could lift the entire tripod, fully extended, onto the moss covered rock at my head. I dug a hole into the moss and anchored one leg of the tripod into the moss, the other leg sat on the top of the rock, and the third leg extended down where I could pin it against the rock with my shoulder to hold it still. I held on to a rock with my left hand and with the cable release attached I could reach up with my right hand and trigger the shutter. I set the shutter to a 2 sec delay so I had enough time to press the shutter release, then hold the third tripod leg still before the shot went off. Of course, lifting the camera that high over my head meant I had no idea how the shot was composed...I couldn't see it. After each shot I'd pull the tripod down, look at the shot, adjust the tripod and camera angle slightly, then try again. Unfortunately, each time the tripod was lifted it would end up in a slightly different position because the moss kept giving way to the weight of the camera (further proof that I made the right decision not to stand on it myself). Some shots were angled too far down, some too high, some crooked. It took 37 trial and error photos before I got what I wanted. Standing there like that, lifting the tripod up and down over and over....well, it was probably the most awkward and ridiculous position I've ever stood in to take a photo. Thank goodness no one else was around to see me, I'm sure I looked like an idiot. Here's a diagram of how I looked getting the shot. The phrase "When life give you lemons, make lemonade" is such a cliché, but there's a reason it is over used....it's still true. When presented with an impossible to get shot, keep looking. Don't let Nature or the situation easily dictate what you can and can't do. Fight back. Try coming at it from different angles, both figuratively and literally. You just might find a way to capture what you have in mind. Be persistent, be thorough, and most of all, get creative.